These ten inch diameter hand-blown glass gazing globes are created by Mexico's glass artisans using traditional glass-blowing techniques. Their reflective quality and brilliant colors will make a stunning addition to your garden, patio or indoor displays. These hand-blown glass globes are also known as: mercury-glass balls, mercury-glass globes, witching balls, mirror balls and garden globes. Important Note: Because of the glass-making techniques used, expect these gazing balls to have air bubbles and other imperfections that are characteristic of hand-blown glass. The bottoms of the globes have a small open spout where they were connected to the glass blowing pipe. As with all hand-blown glass, expect some variation in size and color to these unique handmade globes. Colors: Use the dropdown menu to choose from 6 colors available. 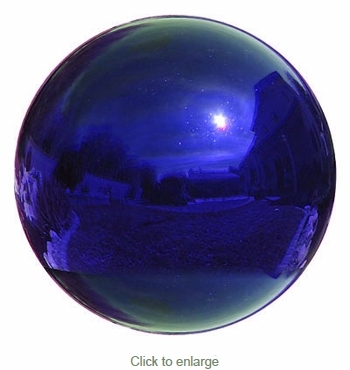 Handblown Glass Garden Globes - 12"